Pécs, one of the major cities of Hungary is located in the southern part of the country. Thanks to the protective Mecsek mountains, lying north of the city, harsh weather conditions seldom bother locals. Temperate climate possesses a Mediterranean quality. Pécs is famous for its relics and culture of the past. The more than 2000 years old town is the home of art and culture and it is famous for the museums as well as for its artistic life. Pécs and his surrounding is also popular of a region for grapes and wine. 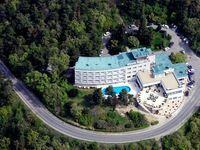 Location: The hotel is located in one of the most scenic spots of the Mecsek mountains, right above the downtown of Pécs. 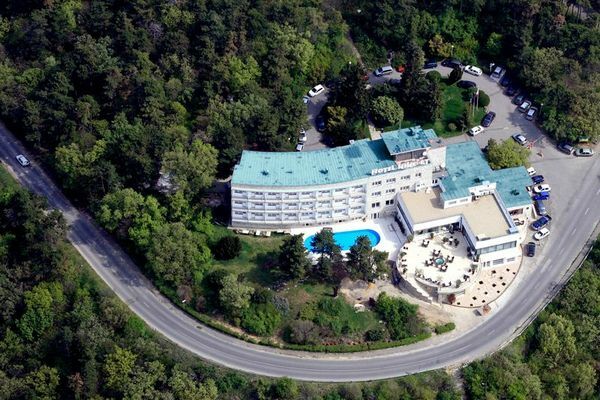 The hotel offers a unique, spectacular view on the town and the neighbouring hills. Guest room information: In the three-storey building - which is under protection of the Heritage Authorities of Hungary - are 33 double rooms available for our guests. - We accept bank cards and credit cards. • Half board is available at 4500 HUF per person. • Pets are allowed for an extra charge of 5000 HUF per day.